Netwrix Auditor for EMC audits Dell EMC VNX and VNXe, Isilon, and Celerra storage devices to help enterprises strengthen data security, streamline compliance and increase operational efficiency. It enables complete visibility into your storage environment by tracking all changes to files, folders, shares and permissions; reporting on data access events; enabling data discovery and classification; and revealing data usage patterns and data ownership. Provides valuable insight into sensitive data on Dell EMC Isilon and Celerra, VNXe and VNX file servers, including the location of the data, permissions to it and activity around it. Unlike native Dell EMC Celerra, VNX, VNXe and Isilon audit logs, delivers information about every change in a human-readable format with clear who-what-when-where details, in both predefined and custom reports. Enables access management across your Dell EMC file servers by reporting on both successful and failed user access attempts with complete who-what-when-where details. 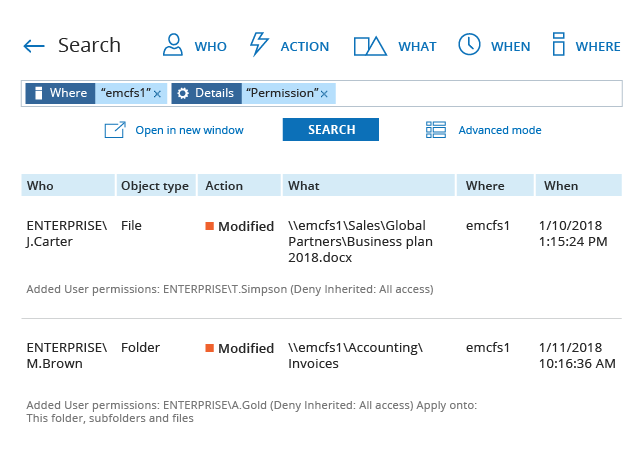 Empowers you to keep permissions to sensitive data in compliance with internal data security policy and external regulations with features like easy comparison of current and past permissions settings. Notifies you about attempts to access your data, changes to permissions to critical files and more, so you can quickly spot aberrant user file activity and external attacks that threaten your sensitive information. Provides valuable insight into data usage and data ownership, and identifies duplicate files and stale data on Dell EMC VNX and VNXe devices, Celerra storages, and Isilon clusters. Makes it easy to prove your compliance by providing hard data in predefined audit reports aligned to standards such as PCI DSS, HIPAA, SOX, FISMA, GLBA, CJIS, GDPR and more. Enables you to quickly sift through audit events by fine-tuning your search criteria until you find the root cause of an issue or the answer to a specific question from an auditor. Provides security intelligence that helps you identify and remediate security gaps that put sensitive data at risk, such as an abundance of directly assigned permissions or potentially harmful files on your Dell EMC storages. Streamlines insider threat detection by providing a single view of user accounts and their associated risk scores, and easy access to the complete activity trail of each user. Enables you to spot suspicious spikes in user file activity that might otherwise go unnoticed by providing intelligence about data access trends and data access surges. To protect sensitive data stored on Dell EMC storage devices from leaks and comply with industry and government regulations, organizations must audit files and folders on these storage devices. 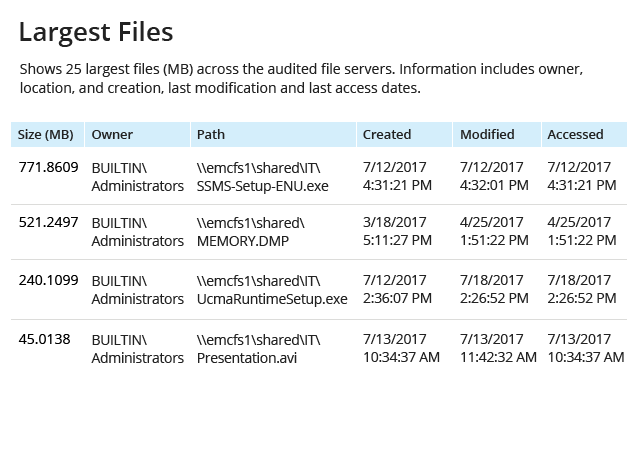 Netwrix Auditor for EMC simplifies Dell EMC VNX and VNXe, Celerra, and Isilon auditing and reporting to help organizations keep their sensitive data safe from unauthorized access or changes. Enable continuous Dell EMC VNX and VNXe, Celerra, and Isilon file auditing to ensure that no suspicious activity around regulated data, such as privilege escalations or failed read attempts, slips under your radar. Ditch manual processing of native Dell EMC Isilon, Celerra, VNXe and VNX audit logs. Quickly investigate suspicious file activity, such as repeated failed access events, privilege elevation or mass deletion of files, using the Interactive Search engine. See who has access rights to critical data that they rarely use. Get data owners and department managers involved in privilege attestation so you can revoke all access rights that are not required for users to perform their jobs, and thereby minimize your attack surface. Identify which data is no longer in use and can be safely deleted or archived. Easily spot files that have multiple copies, determine which files occupy the most storage, and identify redundant or empty folders. Use this intelligence to clean up your storage environment and increase user productivity. Read how Netwrix Auditor for EMC can help you improve data governance, prove compliance, and ensure security of data across your Dell EMC storage devices. 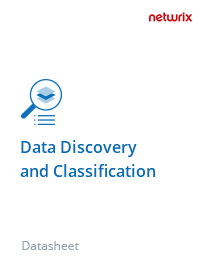 Discover how Netwrix Auditor – Data Discovery and Classification Edition empowers you to locate critical data and secure it in accordance with its value or sensitivity. Palmer College of Chiropractic validates internal security policies with complete visibility into changes and data access events. FNBT centralizes control over the activity of 300 users across 17 locations and improves reporting to the OCC. BankCard Central streamlines its recurring compliance audits, including PCI DSS, SOX, GLBA and FISMA. HBOR successfully reorganized its permissions structure and saves up to 15 hours each quarter on reporting. "Netwrix Auditor is a great product that helps us secure large amounts of sensitive data, such as students’ health records and their parents’ financial information. Every day, the software delivers invaluable insights into what’s going on across our file servers: We can seamlessly monitor user activity, ensure conformance to security policies and investigate incidents." Many organizations rely on EMC network storage devices to keep large volumes of data because of their high performance and scalability. To protect sensitive data from unauthorized access or modifications these organizations must monitor everyday file activity on their data storage. EMC event logs don’t make this task easy because of the complete lack of any native reporting capabilities. 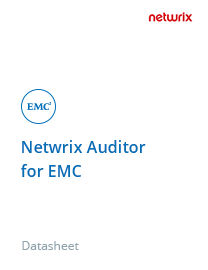 Netwrix Auditor for EMC overcomes these limitations by tracking every change and data access attempt across the EMC environment and converting the audit data into human-readable reports. 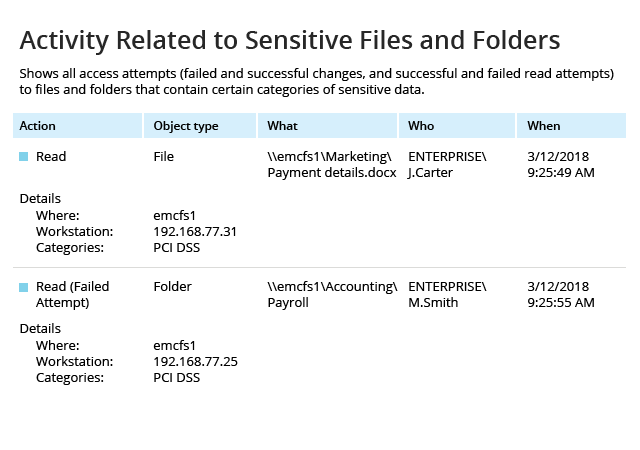 For instance, its EMC report on user activity summarizes all file activity by user, including changes, file reads, failed access attempts and file deletions. This report helps pinpoint users with suspicious activity. Netwrix Auditor for EMC provides comprehensive auditing capabilities for EMC VNX storage devices. It automatically collects audit data and transforms it into easy-to-understand reports that detail who made file, folder or permission changes, and when and where each change happened. Other reports reveal successful and failed attempts to access protected data across the VNX storage environment. Thus, Netwrix Auditor for EMC enables continuous VNX monitoring and reporting and delivers complete visibility into all access events and changes. The EMC Isilon storage system is well known for its scalability and its ability to handle extremely large volumes of data. These capabilities are especially valuable in industries that generate massive amounts of sensitive data, such as healthcare, financial services and media. These organizations are often required to track activity on their file storage devices so they can detect unauthorized changes or access events that can lead to data breaches. Netwrix Auditor for EMC delivers complete visibility into EMC Isilon storage by tracking and reporting on all changes to sensitive data, permissions and data access attempts. This enables organizations to tighten their data security and comply with industry regulations. If your organization stores sensitive data on Dell EMC storage devices, you need to be sure that nothing can put that data at risk — and be able to prove that to auditors. When it comes to safeguarding your critical assets, having a basic EMC monitoring and reporting tool is simply not enough. You need a reliable software solution that can not only monitor all activity happening on EMC storage devices, but also report on illicit activity, so you can spot and investigate security incidents faster and thwart attacks in their early stages. Only then can you prevent data breaches, compliance failures, and disruption to file storage usage and operations.